When the vessel moves astern , pressure conditions on the rudder is almost on the contrary. The capability of the rudder decreases During reverse maneuvers it is impossible to change the shaft position on the conventional rudders. Therefore , the advantages of rudder for ahead returns to disadvantages. In order to remedy this issue , the torque generated on the pressure surface of the rudder should be increased. By this invention reversible rudder , the rudder area is changed by a simple move for ahead and astern maneuvers of the vessel. The Tool for Extraction of Water Samples incorporates a small tube or thiever 1"x 6" for extracting a water sample from a water tank. The thiever is attached to a chain, which is attached to a reel fo reeling up the thiever. The device has a carrying handle and a base to allow for setting on a planar surface. Buoy is designed and built to enable sinking or floating to the surface. Using laterally swinging foils to transmit human power from pedals this craft will easily sustain 8 kph with just 2 OB and 7 carrying a payload up to 400 kgs. It will penetrate winds up to 18 kph. Although designed for leisure use in a tropical climate it could easily be adapted to give crew shelter for fishing in more hostile environments. 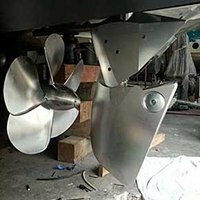 The propulsion system has been in use on a prototype hire craft for 4 years and showed good reliability and resilience. The new version on the drawing board has many advantages over this version. This throttle utilizes a twist of the wrist action for smoother control and more precision in operation. It also allows for other controls to be located on the throttle for more convenient access. Light weight, non corrosive trolling motor stabilizer. COMMERCIAL REVERSE OSMOSIS MEMBRANE REMOVER... A SIMPLE ROUND ROD WITH A HAFE INCH FEMALE NPT COULPER ATTACHED TO THE END WITH A HEAVEY MOVABLE SLIDING WEIGHT ON THE OTHER END..........SCREW ON TO A MALE FITTIING EXSTENDING FROM MEMBRANE AND WORK THE WEIGHT SLIDE BACK AND FORTH VERY DIFFICULT TO REMOVE MEMBRANES SLIDE OUT WITH EASE .